Hard-working London-based tenor saxophonist Brandon Allen produces a gem of a CD with his Gene Ammons Project, featuring crowd-pleasing hard bop and soul jazz style sounds from an under-explored repertoire. Originally hailing from Perth, Western Australia, Allen has been a key figure on the London jazz scene for some years: leading late shows at Ronnie Scott’s and curating the splendid Highgate Jazz with Soul Festival (returning in 2018, he says) as well as taking his muscular style of tenor sax around and about with quartets and his sextet as well as playing with the likes of Kyle Eastwood, Paloma Faith and Alex Garnett’s London Supersax project. 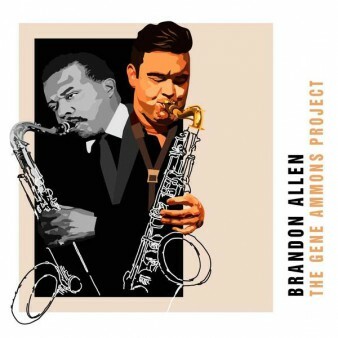 As a way of exploring repertoire for his shows at Ronnie’s, Allen took to exploring the music of different musicians, and found a lasting connection with the musical legacy of Gene Ammons. Ammons, known as ‘Jug’, was one of the great Chicago tenor players emerging in the late 1940s alongside Dexter Gordon, Sonny Stitt and others. The son of boogie-woogie piano legend Albert Ammons, Jug was a very adept hard bop performer who also never lost touch with R&B and the blues. His career was cruelly interrupted by prison sentences for narcotics, notably from 1962-69 when he would have been in his prime. He died in 1974 from cancer at the age of just 49. This CD sees Allen bring together a cracking quartet to tackle music recorded by Jug over the years. There are three Ammons originals alongside swinging themes and plenty in the way of popular songs of the period. Ross Stanley brings his adept touch on both piano and Hammond organ – the latter coming to the fore towards the latter part of the recording, where the band tackle some of Ammons’ soul-jazz output from the late 1960s and early 1970s. Arnie Somogyi similarly brings both acoustic and electric basses, while drummer Matt Home manages to make do with only one kit to produce his crisp rhythms. The ten tracks cover Ammons’ career starting with the late 40s bop of Please Baby, Won’t You Please Say Yes, a fine opener with Allen right on it from the start and an early outing for Home’s drums. The Breeze And I sounds for all the world like a Western movie theme before lolloping into an easy swing. From the other end of Ammons’ career comes Ben, the title song from the 1972 movie which gave a young Michael Jackson his first US #1 hit, with fine Rhodes playing from Stanley underpinning Allen’s finely expressive tenor. Those were different times in music – Ammons’ version was recorded and released within a month of the movie appearing, as happened at the time. Similarly, the band’s take on Son Of A Preacher Man, forever associated with Dusty Springfield and recorded by Ammons just months after its original release, brings this great tune into focus as an urgently grooving organ-based closer. The Ammons originals – none of them previously known to me – include Ger-ru, given a film noir-ish feeling with Allen’s superb growling tenor occasionally double tracking itself for harmonies, and The Black Cat (not to be confused with Jimmy Smith’s The Cat) bouncing along as an early example of shouting soul-jazz.